It is a typically peaceful and picturesque Balinese dawn. Mist clings to the hills of western Bali and, still further westward, the peaks of Java are already reflecting the first golden heat of the day. The sound of birdsong carries clearly across a patchwork of paddies that looks more like well-tended lawns in a romantic English watercolour. It’s a perfect morning for a solitary stroll yet I’m balancing on a paddy dyke with about a hundred other early-risers. The crowd is strangely silent and apart from a single sarong-clad form that hurries along the track there are no women in sight. We strain our ears at the first hint of clanking bells and squint as the first rays of the sun burnish a billowing cloud of dust that rises from behind a stand of banana trees. Then a bizarre vehicle breaks from the cover. A flag billows like a battle standard and above the clatter of chariot wheels I hear the maniacal sound of what appears to be an Apache war-whoop. Two galloping buffalos, driven by a wild figure who has reins in one hand and a nail-spiked wooden cosh in the other, charge towards us as if intent on some hellish barbarian massacre. Somehow the charioteer manages to stay on his feet as he flails at the animals. Streaks of red splash their massive rumps. As they draw closer I notice the painted horns that are flattened along the backs of the stampeding bulls and the carved wooden dragon that rides between their heads. But the crazily bucking chariot thunders past and I breathe a sigh of relief. 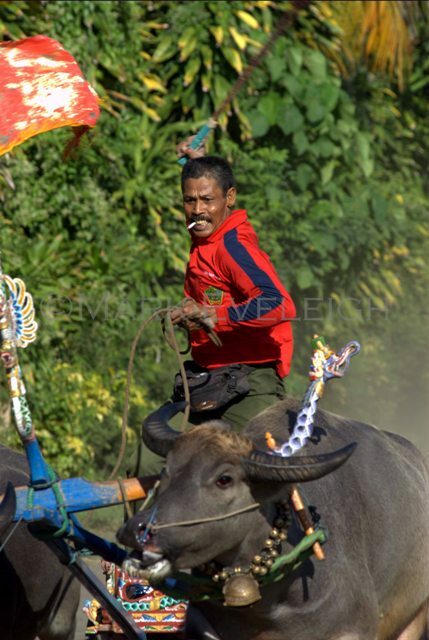 These fearsome chariots are not in fact part of some apocalyptic death-squad but competitors in the west Balinese sport of Mekepung, buffalo racing. The vehicles reach speeds of up to 40mph and the overtaking manoeuvres, with thundering chariots tearing neck-and-neck along the rutted strip of dirt, are not far short of suicidal. The war-whoops and clattering wheels turn the peaceful paddyfield morning into a far-eastern version of Ben Hur as a chariot careens into the rice plants and overturns. Crashes are common and often result in injury not only for the driver but also frequently for the spectators that line the narrow racetracks. Another occupational hazard is apparently a trancelike state that one old man described as ‘speed-craze.’ A young charioteer crosses the finishing line and, inexplicably, begins flailing at his bulls with renewed vigour as he tries to charge them into the crowd. His eyes are glazed and his movements are violent and erratic. While several drivers and bystanders fight to hold the bulls back, others manage to drag him from the chariot. He has quite clearly been taken over by a will that is not his own and as they pry the vicious club from his fingers he passes out entirely. The old man shrugs – “it’s a touch of speed-craze,” he says – but I feel that I’ve had a vague incite into what the old Malay word ‘amok’ really means. If you enjoyed this post, we think you’d also like The divine horses of Rajasthan, Searching for Thailand’s Sea Gypsies and 7 tips for photographing wildlife. Brilliant picture!- even got a glowing fag clenched in his teeth! Tx Deirdre. He’s a cool dude for sure. These guys are real local heroes in West Bali.